The world record for the largest angklung ensemble goes to Washington, DC after 5,182 people of various nationalities turned up on Saturday to literally shake the traditional Indonesian bamboo musical instruments to the tune of “We are the World”. The event took place during the Indonesian Festival held in an open field in the National Mall, a few blocks away from the White House. 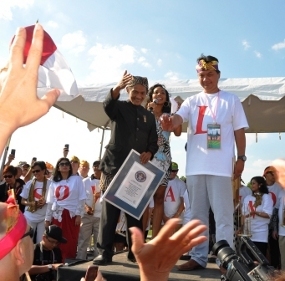 Thousands of people responded to an invitation by the Indonesian Embassy in Washington to join in the world record breaking feat. The throng included Indonesians, Washingtonians, friends of Indonesia and a handful of tourists. The embassy had initially promised the Guinness World Records a 5,000-person turnout. There was a moment of hesitation when only 1,600 people had registered online as of Friday. Many turned up on the day without registration. Those who came spent a good half hour in the scorching heat, with temperatures above 32 degrees Celsius, to learn and practice using the instrument before they got it right and satisfied the adjudicators that it was worthy of a world record. Each participant was given an angklung representing one note. Each of the seven notes was designated the name of one of Indonesia’s main islands. Helping the largely novice but enthusiastic players was angklung maestro Daeng Udjo, who was flown in from Indonesia. He guided the participants with the movements of his hands, which indicated when it was their turn to shake the angklung. The ensemble of amateurs practiced with familiar Western tunes, including “Country Road”, to help build their confidence (and more importantly Udjo’s confidence) before going for the record. As their reward, they went home with the angklung, a batik scarf for women, a batik head band for men and a certificate from Guinness World Records and the Indonesian Embassy recognizing their part in setting the world record. “This is what multiculturalism is all about,” Indonesian Ambassador to the US Dino Patti Djalal said about the theme of the Indonesia Festival and his decision to strive for the world record.